The kids will love this easy recipe for Crock-Pot Sweet Sloppy Joes! Ground beef is flavored with onion, celery, some basic condiments and spices and then a touch of brown sugar for sweetness! Serve with chips or fries for a weeknight dinner the whole family will love! 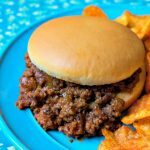 My kids are huge fans of Sloppy Joes, those messy sandwiches full of ground beef and a yummy sauce piled high on a bun (or just bread). 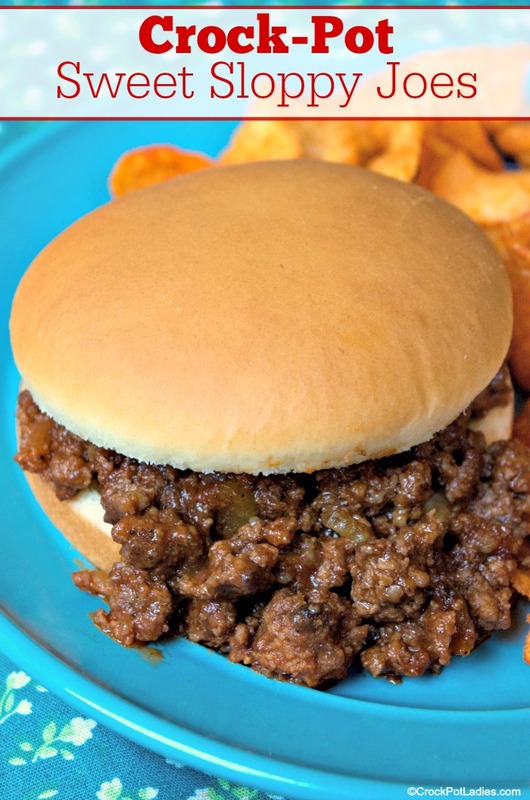 This recipe for Crock-Pot Sweet Sloppy Joes was a huge hit with my kids and was easy to make. Crumble the meat – this just does not happen in the slow cooker unless you stir frequently. 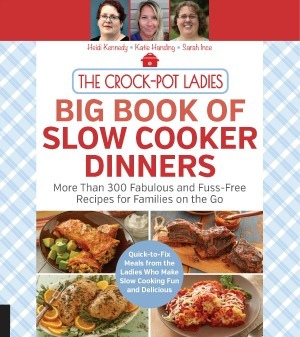 The whole point of crock-pot cooking is not having to baby sit your dish while it cooks. Removes the fat – ground beef is fatty, Precooking your meat allows you to cook off the grease and drain it away (some folks even go a step further by rinsing the cooked hamburger under hot water) before adding it to your dish. What we ladies do is bulk cook. When hamburger meat goes on sale at the grocery store we buy several pounds, cook it up, drain off the fat and portion it out into meal size portions and freeze in zipper freezer bags. Then when we make a recipe that calls for cooked ground beef, we just pull a bag out of the freezer dump it into the crock-pot and add the rest of the ingredients. No need to even thaw the frozen cooked hamburger first! I hope you will enjoy this recipe as much as my family did! 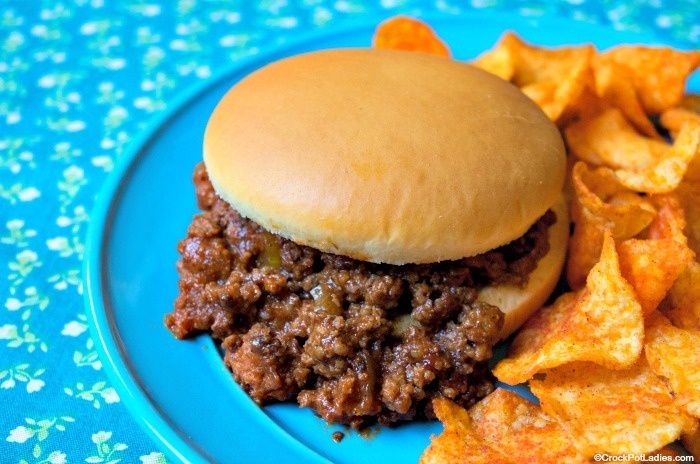 You'll love this from scratch Sloppy Joe recipe. This recipe is sized for your family but can easily be doubled or tripled for a large gathering. And leftovers Sloppy Joe meat can easily be frozen for another meal or quick and easy lunch! In a large skillet on medium-high heat, brown ground beef on the stove top. Drain off excess fat and add cooked meat to a 5 quart or larger slow cooker. Spoon finished Sloppy Joe meat mixture onto hamburger buns and enjoy! We like Schar Classic White Rolls for gluten free hamburger buns. Nutrition information is based on recipe for the Sloppy Joe filling and does not include the bun or bread that you may serve it on. (add all ingredients – except the buns! 🙂 lol!) – picture it! Oh my Diana, thank you for catching that mistake. That should have read 20 minutes for prep time not 20 hours! We like things low and slow around here but not THAT slow! Thanks for having so many great gluten free recipes! Also, I love Schar breads to use as I read you like their rolls with this recipe. Thank you again! You’re welcome Dee! Schar breads are pretty darn tasty! So glad you enjoyed the recipe for Sweet Sloppy Joes!